Finders Keepers: 2012's Books To Hang On To This year's treasures include a heart-racing memoir, a fun first novel, a fascinating study of fraternal bonds, plus Toni Morrison's Home and Christopher Hitchens' last work. Critic Heller McAlpin has sifted through piles of new publications and panned for literary gold. We're making our lists of the year's best reads. Part of a book critic's challenge is to sift through piles of new publications, panning for literary gold. 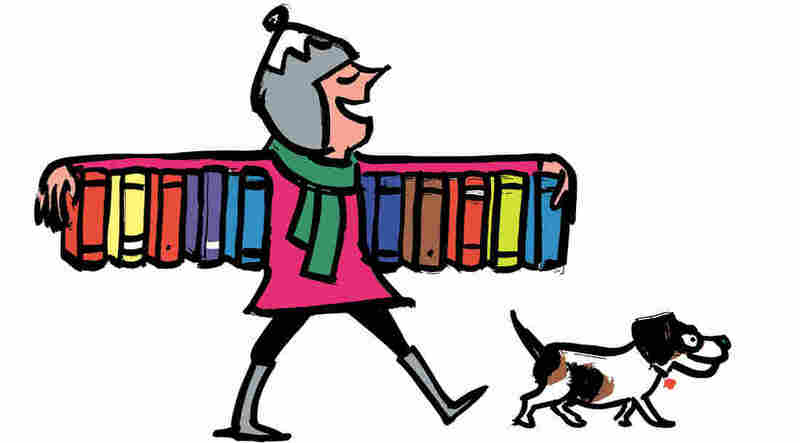 In a way that makes us what one of my favorite children's book heroines, Astrid Lindgren's Pippi Longstocking, called a "turnupstuffer" — "Somebody who finds the stuff that turns up if only you look." Or like Dickens' optimistic Mr. Micawber, who was always sure something good would turn up. This year's treasures — none rescued from obscurity, but all standouts I'm likely to press on friends or want to read again — include a Nobel-winner's blazing illumination of insidious racism; a posthumous memoir by an intrepid journalist who shied from reporting on nothing, including his own fatal illness; a heart-racing memoir about literally outpacing your demons; a fun first novel that makes a passionate case for reading on all platforms; and a fascinating study of fraternal bonds. They're all books I've made space for on my overstuffed shelves — this Finder's Keepers. I'll leave the Loser's Weepers to another list maker. Nobel laureate Toni Morrison's deceptively slight, tightly composed novel Home is a visceral and highly accessible parable of a prodigal son set in the mid-20th century, pre-civil rights South, where African-Americans were still treated, as several characters note, "like dogs. Change that. They treat dogs better." Her hero, haunted by his recent military service in Korea, is called back to the Georgia hometown he'd hoped he'd left for good to rescue his beloved younger sister. In the process of saving her, he revisits horrors as grim as anything he experienced while fighting overseas — but also reconnects with his core values and saves himself. Home raises our gall repeatedly with its unforgettable images, while reminding us of the power of literature to address difficult but ever-relevant issues of race, class, discrimination and conscience. Christopher Hitchens may be one of those writers who is easier to love dead than alive. The boundlessly bold journalist and debater was pugnacious to the point of obnoxiousness. Now that he's gone, I've enjoyed savoring and admiring his moxie, intelligence, range and verve without wanting to throttle him. His posthumous memoir, Mortality, is particularly seductive. Its trenchant, sassy, surprisingly entertaining and ultimately moving contents first appeared as essays written for Vanity Fair while he was fighting the esophageal cancer that would kill him last December, 18 months after his diagnosis. Mortality deserves a spot on the end-of-life shelf because Hitchens writes with mordant self-awareness and candor about the big issues. He acknowledges his excessive, over-lubricated lifestyle but refuses to soften his stance toward what he considered superstition and religious delusion, which he'd spent his life combating in books such as God Is Not Great. He wonders if he'll outlive his Amex, fears the loss of his voice and finds consolation in his friends in his "year of living dyingly." Our consolation is the brilliant work he's left behind, including his earlier memoir, Hitch-22, and his reliably pithy collection of essays, Arguably. Robin Sloan's charming first novel was a happy discovery. This upbeat quest narrative and technological adventure story embraces both paper and screen as platforms for reading. Mr. Penumbra's 24-Hour Bookstore is about an amiable out-of-work Web designer who stumbles on a 500-year-old cult when he takes a stopgap job as night clerk in a mysterious bookshop that gives new meaning to the term "independent bookstore." Actually, it's more lending library than retail outlet, featuring a "waybacklist" of beautiful leather-bound volumes in which the key to immortality is said to be encrypted. Sloan's hero rounds up his Googly geek friends to help him crack this code. (Wish we had such on-call tech support.) Fontophiles will be happy to know that a typeface plays a pivotal role in his story. Although the book suffers slightly from an overly neat ending, open-ended questions about why people love books and what they seek in them provide plenty of food for thought in this delightful paean to the written word. Cheryl Strayed's Wild gets my vote for memoir of the year. I owe my discovery of this adventure story/bildungsroman/rebirth narrative to the raves it received from critics sharp enough to have plucked it from their piles, as well as the gushing recommendations of friends. It's one woman's story about enlisting in a sort of hellish personal boot camp, embracing catastrophe so she can literally travel beyond it. Reeling from the premature death of her mother, the diaspora of her family and the breakup of her loving but unsustainable marriage, Strayed embarks on a grueling three-month, 1,100-mile solo trek hiking the Pacific Crest Trail from California to Oregon, hobbled by too-tight boots, a too-heavy pack and a too-light wallet. This was back in 1995, when she was 26 and desperate to end her downward spiral into drugs and compulsive promiscuity. In the years since, she's clearly had plenty of time to process her experience and hone her craft as a writer. Her personal saga, while no doubt heightened by considerable narrative artistry, still has the ring of truth. Until reading George Howe Colt's Brothers, I thought my daughter's complaint about her older brother from the backseat of our car was the last word in sibling rivalry: "Ian's shadow is touching me!" But Colt's book, part memoir of growing up in 1950s-'60s New England as the second of four brothers, part impressively researched exploration of famous brothers in history, is the book on sibling rivalry. Packed with sometimes jaw-dropping mini-biographies, Brothers zeroes in on Chico, Harpo, Groucho, Gummo and Zeppo Marx, the sum of whom added up to more than their individual parts; and Vincent and Theo van Gogh, whose tragic story illustrates the toll of being one's brother's keeper. Then there are the toxic siblings whose rivalry goes viral, like John and Will Kellogg, who spent years suing each other over toasted bran and corn flakes even as they "goaded each other to greater achievements." Colt demonstrated his sensitivity to complex family dynamics in The Big House, his book about the pain of losing his family's longtime summer place on Cape Cod. To illustrate the ties that both bind and bond, he draws on examples as diverse as Henry and William James, Alec and Evelyn Waugh, the Kennedys and the Kaczynskis — returning in alternate chapters to his own sparring but ultimately close family. Colt cites a study that "found that the average pair of siblings between the ages of three and seven engages in an extended squabble every seventeen minutes" — a figure that actually seems low to him, given his fractious childhood. Happily, he flags enough examples of close fraternal attachments — including the Wright brothers, Henry and John Thoreau, and his own brothers' eventual rapprochement — to prevent his book from being held up as an argument for only children.